Hortus Camdenensis | Eriobotrya japonica (Thunb.) Lindl. Frost-hardy, vigorous, spreading shrub or tree with large lance-shaped, strongly veined leaves, to 30cm long, and large panicles of fragrant white flowers from autumn to winter, followed in spring by edible orange-yellow fruit to 4cm across. To 8m. [RHSE, Hortus, Hilliers']. ‘We are told by Thunberg that this [Mespilus japonica] is a very common tree in Japan, where it grows to a vast size, and bears a fruit which is much esteemed. With us it was introduced by Sir Joseph Banks in 1787. In France it was received from Canton in 1784. It will live here in the open air when planted against a warm wall; but we have never seen it in such perfection as in the form of standard, in the border of a spacious conservatory. Flowers in October and November, and ripens the fruit about May or June. We have been enabled to give a representation of the fruit by the kindness of Sir Joseph Banks, who furnished us with a drawing for that purpose. This has been brought to perfection in our country, at Lord Bagot's, where, we are told, it has been used in the dessert, and much liked for its peculiar but agreeable subacid flavour. Mr. Abel, who had eaten it in China, while in the suite of Lord Amherst, praises it as a delicacy. The drawing of the flowering branch was taken at Colonel Ansley's, at Otto House, North End. The foliage is large and very ornamental.’ [BR f.365/1819]. Listed in the 1850 and 1857 catalogues as ‘Eriobotrya Japonica’ [T.420/1850] and as ‘Mespilus Japonica – Loquat’ [T.677/1843]. It seems likely that the plant imported by Macarthur as Eriobotrya japonica had not fruited by the time of publication of the 1857 catalogue. 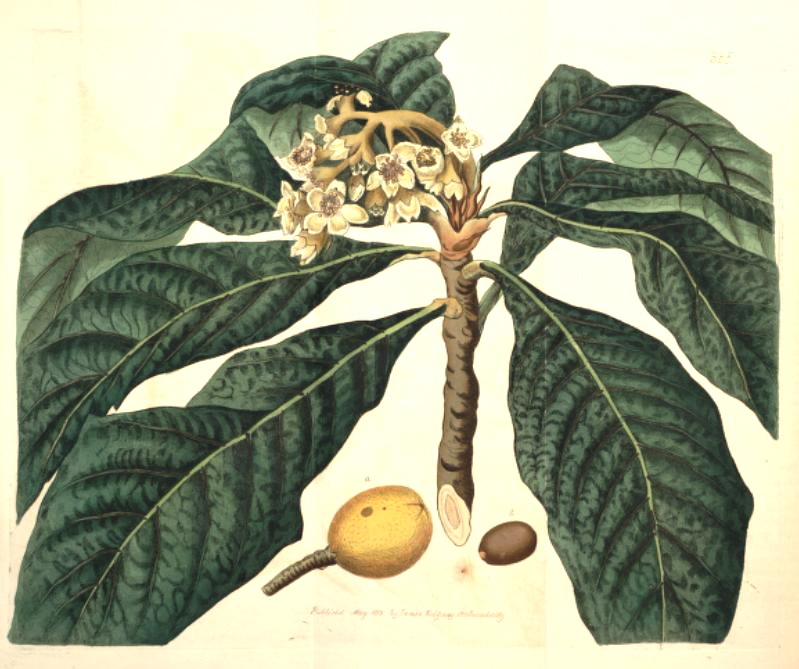 The Loquat is also listed in all published catalogues under ‘Fruit Bearing Plants’. More details about Eriobotrya japonica (Thunb.) Lindl. Photinia japonica Benth. & Hook.f. ex Aschers. & Schweinf.